Climbing Activities in Early Gymnastics . . .
"Gymnastic" training exercises similar to, but less refined than those performed by young climbers these days - involving cultivation of the small muscles and tendons of the body, like the fingers, hands, and forearms - were formulated on an ad hoc basis over 110 years ago. Earlier still, what our ancestors called "gymnastics" included several actual climbing activities. The illustrations that follow expose archaic apparatus climbing drills sufficiently close to rock climbing to suggest that gymnastics-inspired rock climbing, usually assumed to have begun in the late 1800s, may have occurred, in undocumented, isolated instances in the late 1700s - if not before. From its inception as the foundation of the physical education movement in the 14th century, gymnastics often included climbing exercises on various pieces of apparatus - ropes, ladders, poles, and masts. As artistic gymnastics assumed center stage during the mid and latter part of the twentieth century these climbing activities gradually disappeared - the last to go being rope climbing for speed, which finally expired during the early 1960s. However, by the 1970s, the first artificial climbing walls had been built, beginning in Europe. And so, ironically, as rock climbing became more gymnastic, gymnastics abandoned climbing! Personalities & Practices . . .
Claudius Galen (129AD - 216AD) was a Greek born in Pergamum. He became the most famous doctor of the Roman Empire and is today considered the Father of Sports Medicine. 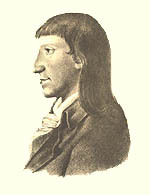 A prolific writer, his references to gymnastic climbing activities - specifically the rope - are among the earliest found. 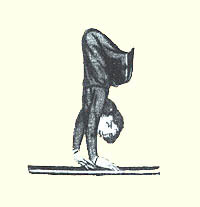 From Gymnastik für die Jugend (1793) by J. F. GutsMuth : "The ancients were not unaware of such gymnastic arts. They called it 'scrambling up the rope' (Greek) or 'ascend by means of ropes' (Latin). According to old documents, the ropes were secured to the ground. Galen mentioned it with the appraisal: 'If anyone climbs a rope with their hands, as children exercise in a gymnasium, they become hard and robust' " - De sanitate tuenda, Lib. II, Cap. 9. (My imperfect translations from the German, Greek, & Latin). During the age of chivalry (1000 - 1600) boys considered suitable candidates for knighthood were taken into the households of noblemen as pages. After several years of training they advanced to squires. The physical exercises undertaken by squires, included climbing ropes, poles, and ladders (see, e.g., Mirror of Knights). Of course, most of their exercises were more closely related to the martial arts of that time. For instance, at the age of 14 the page had to learn to leap into the saddle without the help of stirrups - in Saxon law this was "a proof of the ability of a prince to be able to govern independently and to prove his individual worth" - Gymnastics from the Middle Ages to the 18th Century by L. H. Joseph, CIBA Symposia, 1949. Although the 'sports' of the nobility centered on the martial arts, hunting, and interestingly, dancing, they and the other classes of society enjoyed watching acrobatics - hand balancers and rope dancers, e.g., some of whom had very shady reputations. (e.g., Acrobats and Mountebanks by C. Le Roux, 1890). The common people enjoyed participating in sporting events, as well, "The citizens of the towns and the craftsmen exercised on Sundays and holidays during the summer months. In an allegoric poem of Hans Sachs, the shoemaker poet of Nurenburg, Spring boasts to Winter, that during his season people were 'fencing, pushing the stone, and wrestling, hunting, shooting, running and jumping'. In all guild festivals gymnastics were always part of the entertainment" - L. H. Joseph. Among the literature appearing in the latter part of this period, one finds Francois Rabelius (1490-1553) admonishing the young hero of Gargantua (1535) to practice ". . . climbing ropes, masts, trees, and walls . . .". 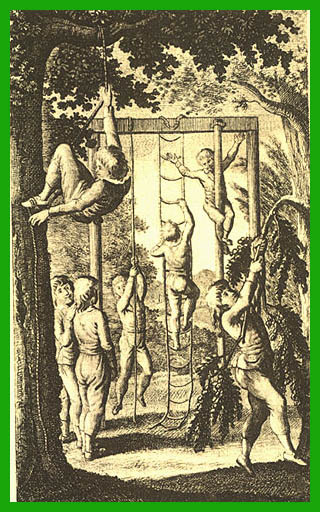 Nine years later, Joachim Camerarius (1500-1574) , in Dialogus de Gymnasiis (1544), describes to a friend his idea of a model school for the common people, in which there is an opportunity for the students to practice indoors, hanging from a bar and climbing ropes. Hieronymus Mercurialis (1530-1606) wrote what became, in his time, a very popular book describing the "gymnastics of the ancients". He drew upon ninety-six Greek and Latin authors to reproduce the ancient gymnasia and gymnastic exercises in De Arte Gymnastica (1569). 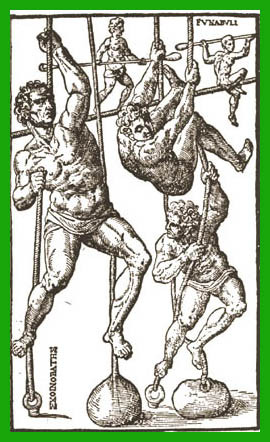 From the illustration on the right, it would seem that rope climbing is indeed a primal gymnastic discipline, although there doesn't seem to be any mention of it in the easily available literature of the Greek Games. Incidentally, Mercurialis - a founder of medical gymnastics - recommended mountain climbing as a healthful pursuit, due to it's diaphoretic qualities. He rejected many athletic exercises for a variety of reasons, considering only rope climbing and wrestling wholesome. "In reality, all the books on gymnastics of the next centuries are based on this standard work of Mercurialis" - L. H. Joseph. 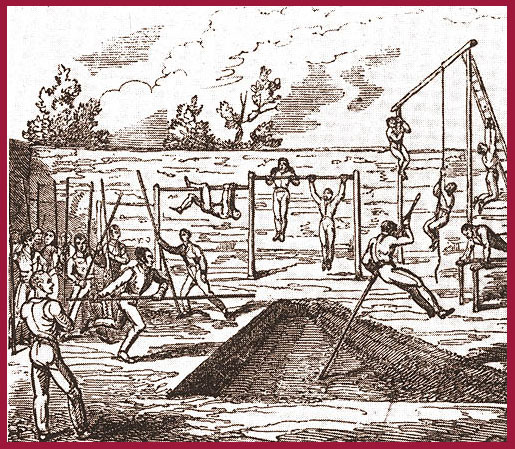 In the New World, before the 1800s, one can find few references to gymnastic climbing activities, although running and leaping contests were popular pastimes for settlers. In Mexico, however, Fray Diego Duran describes watching an Aztec climbing feat: ". . . to see an Indian standing on top of the 'flying pole' (for so they call it) anywhere between one hundred eighty and two hundred feet in height! He stands there with a trumpet in his hand, and, just watching him, those who observe become giddy . . . after having performed a thousand turns and tricks, he descends with an expression as serene as if he had done nothing!" - The Book of the Gods and Rites and the Ancient Calender, ca. 1577, trans. & ed. by F. Horcasitas and D. heyden, 1971. The illustration below depicts one of the first apparatus created for gymnastics instruction in schools, and appears in the 1793 book, Gymnastik für die Jugend, by Johann Friedrich GutsMuths (1759-1839) - the first textbook of "modern" gymnastics. The climbing frame was the model for the climbing apparatus used in many European schools until, perhaps, the late 19th century. An elaborate and later version of the frame is on a subsequent page of this section. GutsMuths took his pupils on hikes into the countryside regularly. There is a strong likelihood they did some elementary boulder climbing on these excursions. A Calamity . . . ! F. Jahn (1778-1852) is considered the founder of modern gymnastics. Although Joachim Camerarius had suggested "hanging from a bar" in 1544, Jahn is generally given credit for inventing the horizontal bar. He also invented parallel bars, which, when added to the wooden vaulting horse he constructed from a tree trunk in 1812, constitute much of the apparatus for formal gymnastic competition nowadays. A strong nationalist, Jahn coined the word Turner to designate a German gymnast, avoiding the Greek "gymnast". His outdoor gymnasiums - Turnplatz - were the forerunner of modern facilities, and led to the founding of Turnvereins, which profoundly influenced gymnastic development in both Europe and America. One of the first Turnplatz . . . This drawing, from approximately 1811, shows one of the earliest Gymnastics Fields or Turnplatz in Germany. Note the climbing frame on the right side, with an attached oblique ladder. This may have been Jahn's invention. It was essentially GutsMuths' frame, but whereas GutsMuths merely kept a wooden ladder near the frame, in order to climb up and attach the other pieces - using the wooden ladder as an apparatus only when it was placed against a wall - Jahn incorporated the ladder as a piece of apparatus fastened to the frame. It is possible this illustration depicts Jahn's initial version of the famous turnplatz at Hasenheide.